Google Maps is an important part of any SEO campaign. 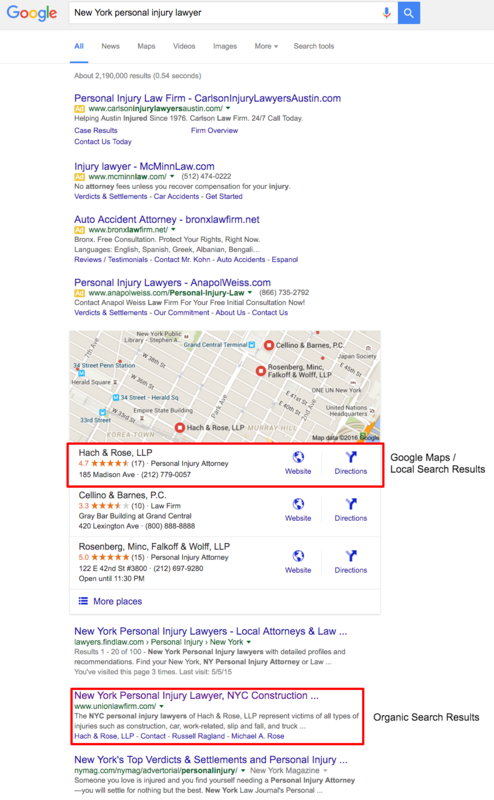 Since early 2009, Google has continually tweaked the local search section and how local results populate in the natural results. Recently, local SEO became even more competitive when the number of map results displayed on the first page of Google was decreased. So, whereas seven map results were once standard, there are now only three results that are displayed on the first page. Providing and updating a business’ information in Google My Business—the dashboard for managing a Google Maps listing—is an essential part of any comprehensive SEO campaign; this kind of work can benefit both your local ranking on Google and enhance your organic search and Maps presence. Aside from creating and managing your Google My Business profile, we utilize dozens of directories to support our local search strategy for our clients. While it doesn’t always work out as ideally as it did in the example below, our goal for all of our clients is to make them “the obvious choice.” That means we always intend to obtain the best possible visibility in the organic search results, in Google Maps, and in paid placements (Google AdWords) for our clients.